We hope everyone is having a great summer so far. Are you making art? Traveling? Whatever you are doing, have fun. Our May meeting was a fun hands-on meeting making gel prints. 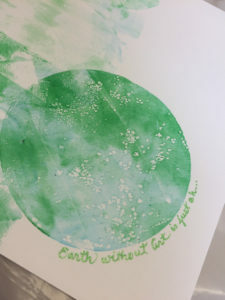 Big thanks to Jo Diamantes and Patty Bertsch for presenting, and to Jacqueline Sullivan for the loan of gel plates so everyone could experience this way of making prints. In this age of so many non-profits needing money to help continue their reach, we are no different. This is not a call for donations, although it would be nice, we have an easy way for you to help our guild by just doing your normal grocery shopping. We are now enrolled in the Kroger Community Rewards Program. When you shop at Kroger with your Kroger Plus card that is registered, and you have chosen the guild for a reward to go to, we will get a donation. If do not have a Kroger Plus card, they are available at the customer service desk at any Kroger. Enter NPO, 78656, number or name of organization, select organization from list and click on confirm. Please feel free to share this info with friends and family as anyone can choose us as a charity. So, register, and get to shopping for that July 4th BBQ. And thank you from the guild for helping us offset operating costs.